Can You Feed a Dog Carrots? 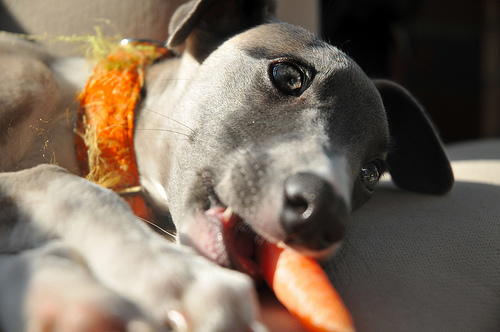 Some dogs love carrots, which provide nutrients as well as a great taste. Carrots can supplement a balanced diet and promote weight loss in dogs. My parents have 2 dogs: Ava and Jammer. They’re both Labradoodles. Jammer, Ava’s daughter, is bouncy and fun-loving. Ava, on the other hand, has a slow, graceful, if snobbish, air and rarely gets excited about anything. But Ava’s cool reserve is broken as soon as I open the fridge, and particularly when she hears I’m opening the vegetable door — where the carrots live. When both dogs hear this, they break out into a full gallop and slide into and jostle each other to stick their noses into the gapped hinge of the refrigerator door, certain I’m about to gift them their favorite treat. Jammer rears up on her hind legs, pedaling her fluffy paws at me like a show horse; 11-year-old Ava, meanwhile, jumps straight up, tail wagging. My dad originally discovered the dogs’ love for these veggies after dropping a few baby carrots one day — only to have them immediately vacuumed up by the dogs. Then the dogs’ obsession began, and my dad started slipping them carrots regularly. Can dogs be fed carrots? Absolutely. Carrots in their raw form can help dogs maintain strong teeth because of the amount of chewing involved; these veggies also act as a great polishing agent to keep your canine’s bright smile shining. Nutritionally speaking, dogs can benefit from carrots just as humans can — the fiber, antioxidants, low number of calories and high concentration of beta-carotene are welcome additions to a balanced diet. For older dogs prone to sensitivity and irritation in the mouth area, cook or puree carrots and add them to their dog food. But don’t worry — the softened vegetable will maintain most of its nutrients. Although carrots and other fruits and vegetables are considered healthy supplements to our pets’ diets, the debate rages on concerning feeding domesticated animals a purely vegetarian diet. Celebrities like Alicia Silverstone promote the vegetarian diet for her dogs that she herself consumes, yet veterinarian Patty Khuly cautions pet lovers about the potential dangers of withholding animal proteins from pets’ diets. Every pet is different; it’s important to find out what nutritionally works for each dog, regardless of the latest trend in diet. Not all dogs love carrots as much as my parents’ dogs do. If your dog turns up their nose at carrots, there are several other healthy veggie options you can choose from to supplement your dog’s diet. But don’t just feed your dog anything from the scrap table; ASPCA has published a list of people foods that are toxic to dogs and other animals, and it’s a good idea to take a look before feeding your dog foods you eat yourself. In other words, do your homework on what’s best for your dog to eat and always talk to your vet about any dietary changes for your pet.